A group of year 1 and 2 children to ‘The Hundred of Hoo School to participate in the ‘Howard Schools Partnership (HSSP) Multi-Skills Festival. The children had to take part in a variety of activities which covers movement, balance, co-ordination and aiming skills. We were extremely proud of the children who were well behaved and all walked away achieving a silver certificate! 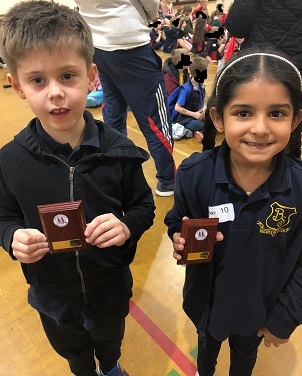 Congratulations to Tyler (Yr2) and Mya (Yr1) who were awarded the Endeavour Award, as they showed good sportsmanship, positive attitudes and excellent behaviour. A big well done to all of thechildren, they worked incredibly hard and we are very proud of them.